Ohana Matsumae is a cynical 16-year-old whose role is practically reversed with her philandering mother. She has found steadiness and routine in her Tokyo life until one day, her mother and her current boyfriend run off in order to avoid debt collectors. In a blatant after-thought, Ohana's mother sends her off to a Taisho Period hot spring inn owned by her grandmother. And thus, Ohana's monotonous city life is turned on its head as she adjusts to country life in Kissuiso. Hanasaku Iroha is an anime full of familiarity, and in many ways, that is one of its strengths. This series could have gone in so many directions, and I entered this viewing in a tentative state of apprehension. After all, the backdrop for this series was that of a hot spring, and what do those episodes tend to serve? As fanservice. Was this going to be an entire season of fanservice with cute female stereotypes masquerading as a coming-of-age series, or was this going to be something with actual substance? I am glad to say, after a bit of a shaky "will it or won't it?" 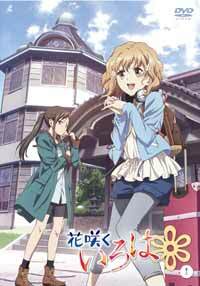 start in the beginning, Hanasaku Iroha was definitely not your typical fanservicey fluff-and-nonsense slice-of-life series. There are so many strong points in this series that could have brought this up to be one of the hidden gems of the Spring/Summer 2011 season. With a huge production staff (celebrating P.A. Works' 10th anniversary), the production values in this series are apparent, with seemingly flawless animation and character design, subtle use of CGI when needed, a beautiful soundtrack (with more than its fair share of insert songs), and a star-studded vocal cast, it's a good thing the series itself didn't waste all these crucial ingredients away. The audience benefits from an endearing and earnest lead in Ohana, who, doing her darnedest to fit in to her new surroundings, over-compensates by meddling where people tend to not want her. Her helpfulness is often seen as arrogant and condescending, and it takes determination for her to not get discouraged and overcome the obstacles that are the Kissuiso staff. The characters are, for the most part, well-rounded and distinct. They are developed subtly, with little snippits of their past and their backgrounds not being revealed until the second half of the series. Some people found this to be too long of a wait (especially when it came to my personal favorite character, Minko) but I found that it gave more opportunity to develop your own opinions of the characters, only to have your own image of them shaken a little with reality. For example, there is more to the soft-spoken and mousy Nako, once you learn about her family life. The hardened manager, Ohana's grandmother Sui, is one of the more endearing characters as the series goes on, as we learn about the history of the inn and the outcome of several management decisions. The unfortunate thing about Hanasaku Iroha is that, like often seen in traditional Japanese storytelling, we only skim the surface of what is seen at Kissuiso. The writers introduce to us a lot of plot-lines, and continue to add conflicts and sub-plots well into the last few episodes of the series. In true form, everything seems to come together in the climax of the final episode, almost a little too neatly, although pleasantly open-ended in all the good ways. Hanasaku Iroha was an endearing glimpse into daily life between Tokyo and the country-side. The characters are enjoyable, the storylines engaging, and the overall production is a therapeutic treat on the eyes. The series could have benefited from an additional season, and it's a shame that I'm left wanting to see more. Sadly, after a few months or so, I'm sceptical that this series will be remembered all that easily. Recommended Audience: As this is a bathing house, there are certainly bathing scenes, though nothing inappropriate is shown. The earlier episodes have a bit of adult tone as they involve an "adult novel" writer in the subplot, so teen seems appropriate.